Corporal Richard B. 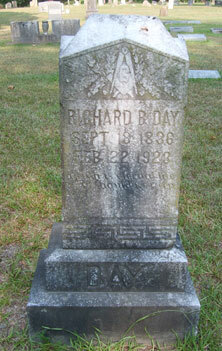 Day was the son of Richard Day and Elizabeth Penn, and the grandson of David Day, Jr. and Stephen Penn. At the time of his enlistment in the 1st Alabama Cavalry, US, 26 August 1862, he was 25 years old, 6' tall, light complexion, grey eyes, dark hair and his occupation was carpenter. He had a brother, James H Day , and a nephew, George W Day, in the 1st Alabama Cavalry. On the date he was mustered in, in Nashville, Col. Stokes appointed him 1st Sgt. In January and February 1863 he was on detached service as a courier near Murfreesboro, TN and was in Readyville on 27 January. He was reported missing or missing in action on several days during Col. Streight's raid through Alabama. He apparently received a wound to his side from a bayonet at or near Day's Gap and could not accompany his unit to their eventual capture at Cedar Bluff. There is a "Prisoner of War" slip in his file but provides no other information. His name was not borne on the company muster roster from May 3, 1863 until 10 November 1863 when he returned to his unit at Camp Davies, MS. At that time, Col. George Spencer reduced him in rank from Sgt. to Corporal and assigned him detached duty in ordinance. In July 1864 in Rome, GA, surgery was performed on Corp. Day for a fistula. It was done by the Regimental Surgeon, Dr. J.G.C. Swaving, a German, who soon after had his leg broken by being kicked by a horse. A Dr. Davis from Randolph County completed treatment. On 10 November 1864, he left from his unit at Rome and accompanied Maj. Jude Shurtleff to Decatur, AL on detached duty for recruiting purposes. He reportedly served as quartermaster and mess sergeant at Decatur headquarters. Corp. Day was admitted to the post hospital at Huntsville on June 26, 1865 where he received further treatment for the fistula. He returned to duty on July 11, 1865 and was mustered out with Company I at Nashville. After he mustered out of service, he returned to Crowdabout and Married Martha Ellen Gibson on 10 October 1866. They would have six children. He was Justice of the Piece in his community and died 22 February 1923 at the age of 86. Richard Day returned to Crowdabout and was married to Martha Ellen Gibson on October 10, 1866. In 1880, he moved a few miles north to Flint. Six children were born to this couple. In 1883, he qualified for a disability military pension. He held the office of justice of the peace in his community and wrote many deeds, wills, and performed the duties of an extension of the probate court as was the custom of that day. He died February 22, 1923 at the age of 86.